There used to be a restaurant in Eureka, California, called Ramone’s Opera Alley Cafe. I never got a chance to eat there – well, I guess I had chances, but I didn’t take them. There’s now a place called Cafe Nooner where it was; Ramone’s lives on as a bakery. Anyway, a few years ago I found an interview online with a guy who cooked at Ramone’s and he gave a recipe for a Spanakopita burger they apparently used to make. I looked at the recipe the other day and it included ground pork along with turkey, which I am sure is delicious but not really on our recommended diet these days. I made some adjustments and made these for dinner last night along with sauteed corn & red onions and a heirloom tomato salad. It was divine. 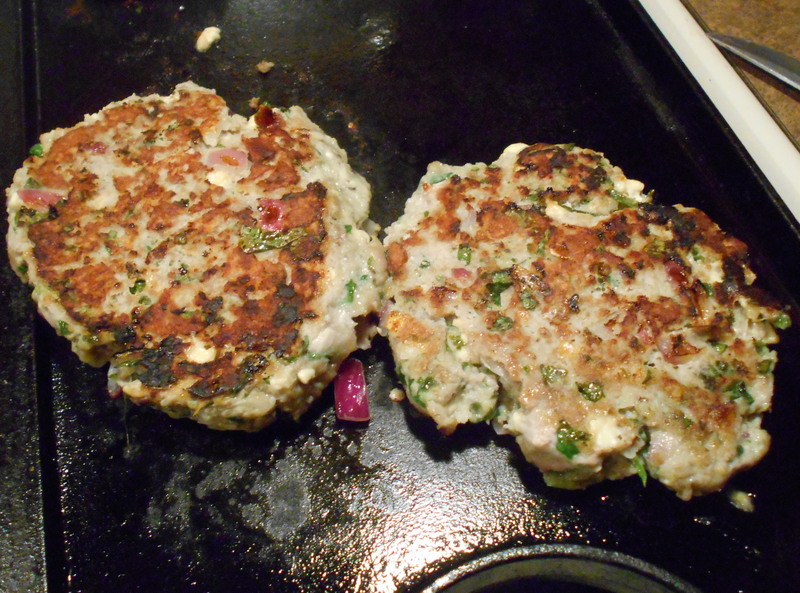 Combine all ingredients and shape into patties. 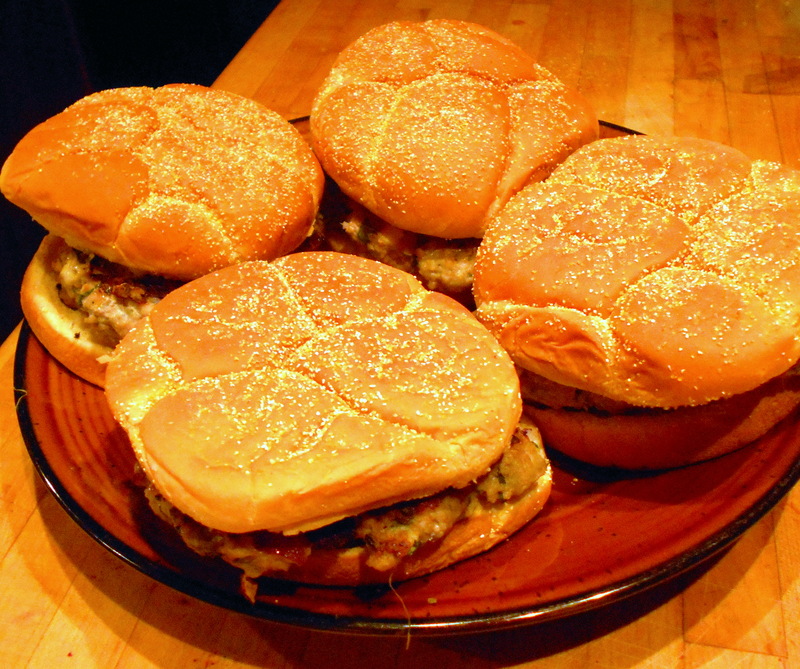 Refrigerate until well-chilled (turkey burgers tend to fall apart easily; the chilling helps them stick together). I cooked these on a Lodge cast-iron grill. Cook until well-done (I used an instant-read meat thermometer). Serve on toasted buns with the usual burger toppings – though we tried some homemade peach chutney in place of ketchup and it was fabulous. 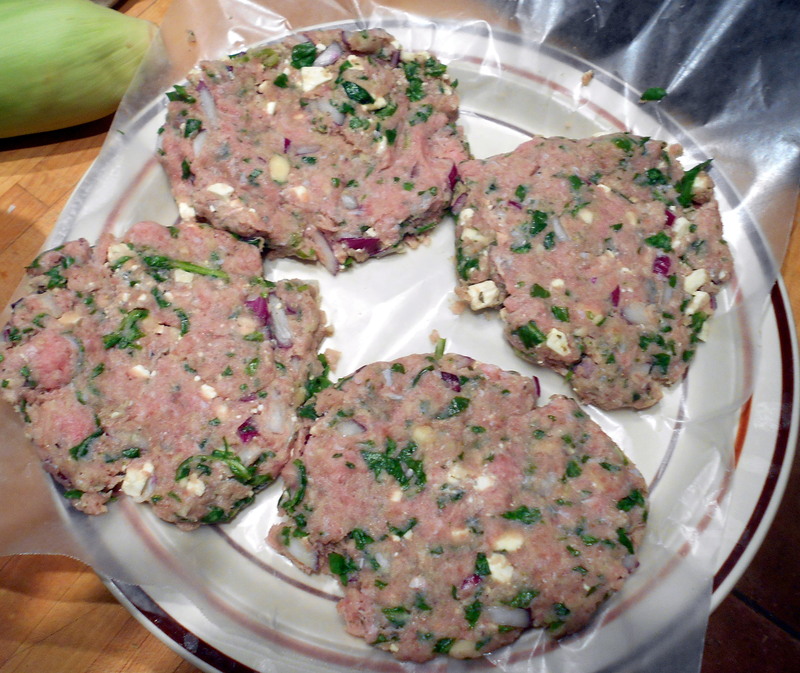 Use half ground pork and half ground turkey. Substitute ground lamb for the turkey; omit the panko. Cook until rare or medium-rare. Substitute blue cheese or gorgonzola for the feta. Substitute basil or rosemary for the oregano. 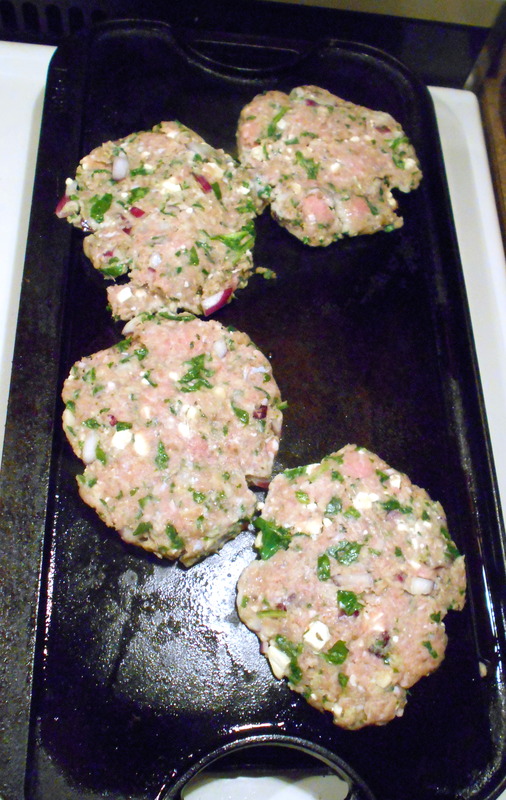 Posted in recipe and tagged burgers, feta, gluten free, Greek, spinach, turkey. Bookmark the permalink. Now then: my previous post was about Crazy Feta, which is absurdly good by itself. But it is a key component of a salad they probably don’t actually make in Greece, but maybe that’s because it hadn’t occurred to them. They have lamb roasting on a spit, stuffed grape leaves, feta, ouzo, spanakopita – what else do you need? Once more, the credit goes to Jessica at How Sweet it Is for coming up with this amazing combination. She says it’s a dip that could be used on chips or in wraps or sandwiches, but I served it as a salad, a messy messy layered salad. I varied mine a bit from hers. I would expect anyone to vary their versions too. Once you have the components made and/or bought, it’s just layering in a bowl. 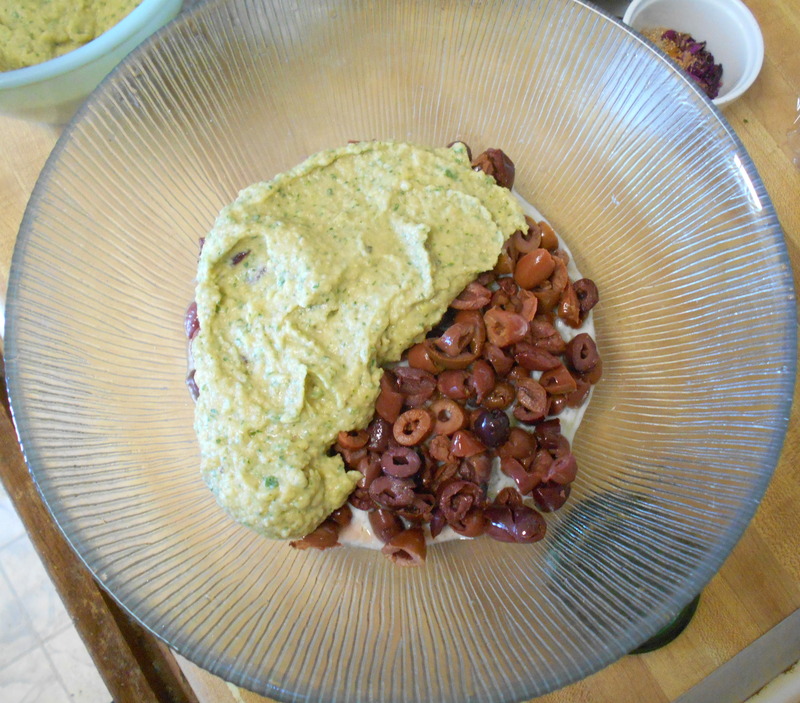 You could also arrange it on a giant platter like those layered Mexican dips and surround with bread and pita chips. Okay, got your dips made? Putting this together is fun. Cover and refrigerate up to eight hours. Drain off any excess liquid that may accumulate. This served 10 people as a salad as part of a dinner. There was about 2 cups left over, which we smeared on sourdough bread the next day. If served as a dip, this would probably serve 15-20 people. I made hummus from one can of garbanzos and one can of cannellini beans, sesame oil, lemon, garlic, and plenty of cilantro. Not traditional but I liked it better than garbanzos alone. 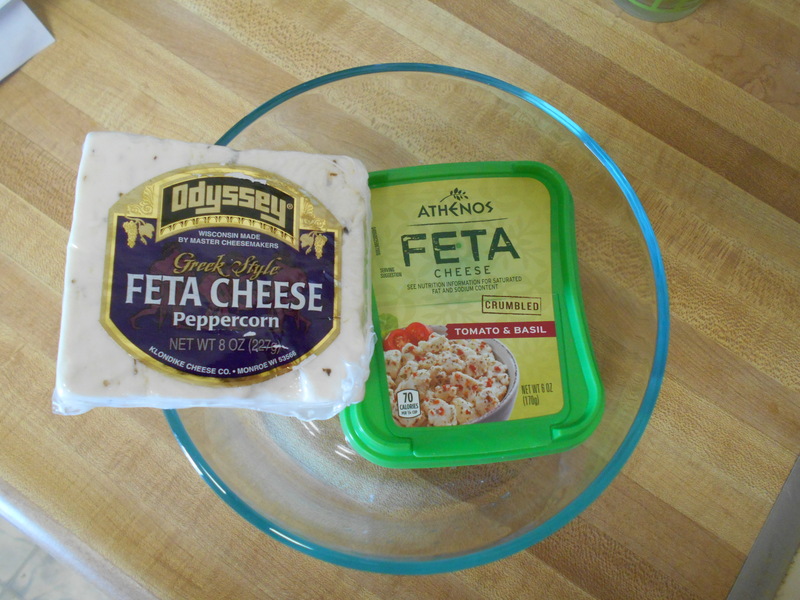 A block of plain feta can be crumbled and used in place of the Crazy Feta. If you are fortunate enough to live near a Middle Eastern market, you can get the sumac and za’atar there. I bought mine at The Spice Shop. Penzey’s also sells them (I can highly recommend Penzey’s spices and service) as well as probably plenty of other outlets. They are not absolutely essential here, but I wanted to add something extra to the tomatoes & cucumbers without salting them (which would cause them to get watery). If these spices are too exotic, sprinkle the tomatoes with pepper and oregano. Trader Joe’s carries both pitted Kalamata olives and artichoke hearts in water, as well as tzatziki, hummus, and feta. Now go forth and make this. 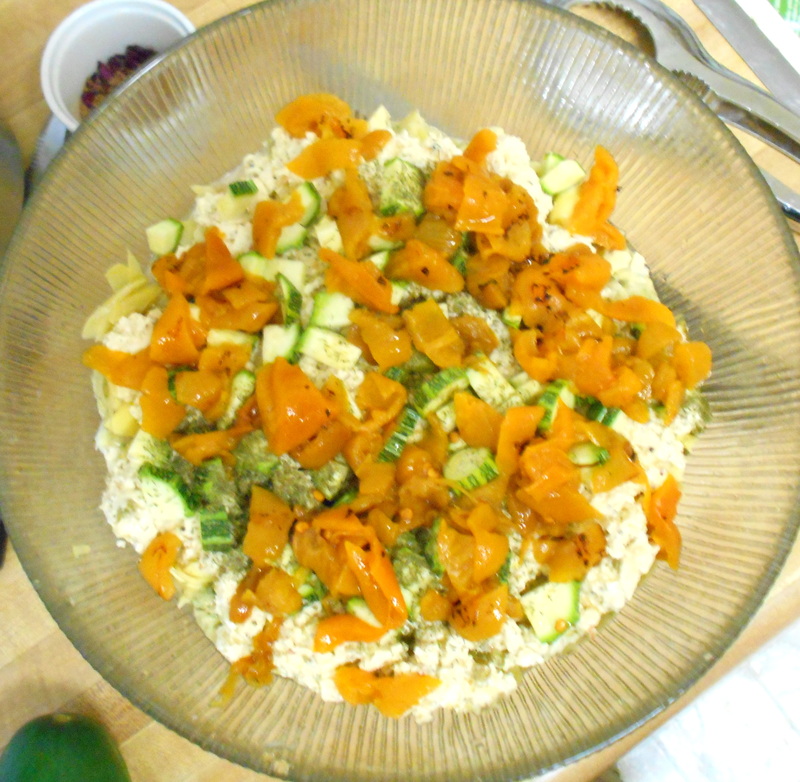 Posted in recipe and tagged dip, feta, Greek, Middle Eastern, salad, salad dressing, sauce, vegetable, vegetarian. Bookmark the permalink. I can’t take credit for this. All thanks go to Jessica at How Sweet it Is for this amazing mixture of deliciousness. I will take credit for being a Google ninja and finding it, though. So you see, I was having my annual Summer Solstice dinner on June 21, which was – surprise! – the actual Summer Solstice. I think Middle Eastern and Greek food goes especially well in the summer, so I was looking for those kinds of dishes. (For some reason I only have one cookbook dedicated to that region, and it seems to be on loan somewhere.) And that was when I found the directions for a Greek Layered Salad, which also comes from Jessica at How Sweet it Is. But it was the Crazy Feta that really sold me. All by itself, this stuff is so fantastic; made into a Greek salad, it approximates Nirvana. Slice the top quarter off the entire head of garlic, just enough to expose the cloves (do not peel away the papery skin). Place head on a sheet of aluminum foil. Drizzle with a very small amount of olive oil, then wrap the foil around the garlic and place it at one end of a small baking dish. At the other end, put the Jalapenos. Put the dish in the oven at 400 degrees. Turn the Jalapenos after about 15 minutes. After about 30 minutes, remove the dish from the oven. Place the peppers in a paper or plastic bag and let them steam about 15 minutes. Then cut the stem end from the Jalapenos, remove the seeds, and remove the blistered skin. Chop peppers finely. NOW WASH YOUR HANDS THOROUGHLY. DO NOT TOUCH YOUR EYES OR ANY OTHER TENDER BODY PART FOR AT LEAST THREE HOURS. I couldn’t find blocks of feta packed in water at the Grocery Outlet, but I did find these two packages, which totaled 1 pound.Works for me. Mash the feta with a big fork. Add the zest and juice of 1/2 a lemon, the minced Jalapenos, and about 1/4 cup olive oil. Then take the roasted garlic and squeeze the sweet caramelized cloves right out of their skins into the bowl. Mash mash mash. You want this to be spreadable and dipable but not runny. You may need more olive oil. Taste and add pepper (and salt, if necessary). When the consistency seems just right to you, pull out a bag of chips and cram everything into your face cover and store in the refrigerator for one week. 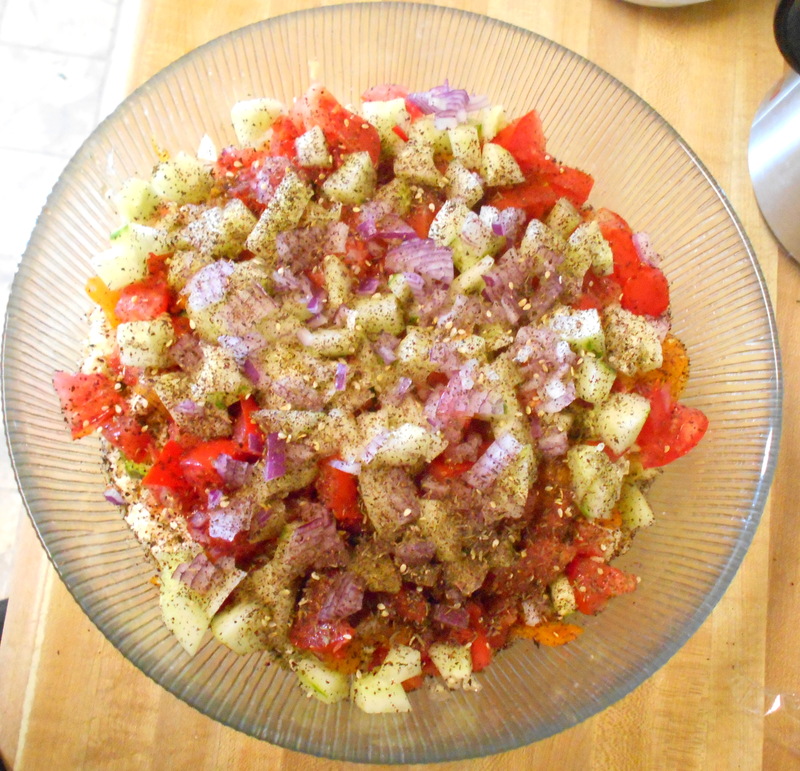 This is an essential ingredient in the next recipe, Greek Layered Salad. 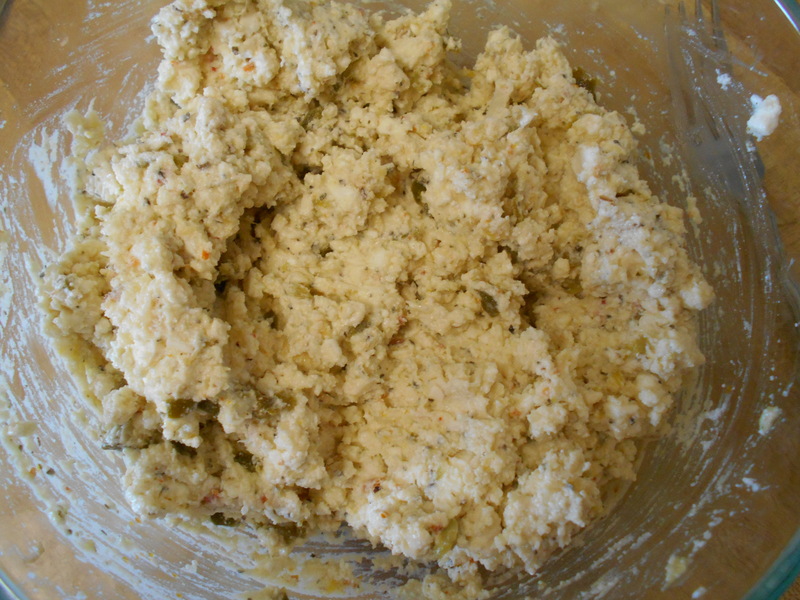 Posted in recipe and tagged cheese, dip, feta, gluten free, Greek, Middle Eastern, salad dressing, sauce, vegetarian. Bookmark the permalink.